You baby will spend an enormous amount of time next to his crib mattresses during his first few years of life, so it is one of the most important decisions you will make. Although not required, we highly recommend choosing an organic mattress. Nearly all standard crib mattresses today contain polyurethane foam, vinyl (PVC), phthalates, chemical fire retardants or barriers, and an extensive list of potentially harmful industrial chemicals. There is growing concern among experts and lay people alike regarding the possible effects of these chemicals on our children. Do you really want your baby inhaling these substances with each and every resting breath? are a healthy choice for your baby. Your mattress should be firm and tight fitting. Soft mattress could allow baby’s mouth and nose to sink into its softness and risk suffocation. 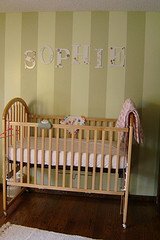 Most cribs and crib mattresses are made in standard sizes these days, so the mattress size shouldn't be an issue. Occasionally you may find that a mattress doesn't fit well with a certain crib, though, so checking the fit is important. The CPSC recommends using a 2-finger rule. If you can fit two fingers between the crib and the crib mattress, get a better fitting mattress. A child could get trapped in the gap between the two or even crawl underneath it and suffocate. Should You Choose a Natural Rubber Mattress or an Innerspring Mattress (Coil Mattress)? There are advantages to each. Natural rubber, also known as natural latex, tends to last longer than a coil mattress. While it will conform a bit to the body, it does not make a permanent impression as easily as cotton or polyester batting. Coil mattresses may develop a dent over time where baby sleeps most often. If you plan on having several children, this is an economical choice. Natural rubber is also dust mite, mildew and mold resistant. For families where allergies are a concern, the rubber mattress is the way to go. Natural latex mattresses also tend to reduce pressure points, which can improve circulation and reduce tossing and turning. Overall, natural rubber mattresses are very comfortable. Innerspring or coil mattresses also have their advantages. The first among them is price. Since organic mattresses generally cost a bit more than conventional mattresses, many parents choose an innerspring mattress to avoid chemical exposure from conventional mattresses. Others choose an innerspring mattress due to a latex allergy. Coil mattresses also tend to be firmer.